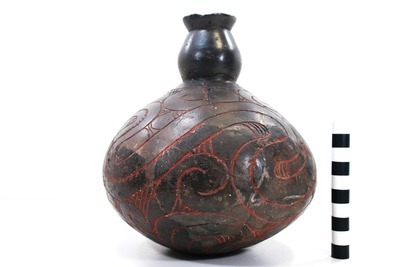 "41HS13, 2003.08.76, Burial 3" by Timothy K. Perttula and Robert Z. Selden Jr.
DECORATION (INCLUDING MOTIF AND ELEMENTS WHEN APPARENT): The vessel body has four upper and lower sets of engraved meandering scrolls with tick marks on the scroll line. The upper scroll fill zones for the sets of stacked scrolls include four engraved hooked arm elements, sets of hatched lines and triangle elements, and brackets, while the lower scroll zones include these elements as well as elongated triangles with hatched lines that the scroll lines curve around (see also Jones 1968:Plate 19a). Natchitoches Engraved spool neck bottle, Burial 3, Susie Slade site: a, side view; b, basal view.